Music, singing and dancing were important features of social life in the Victorian period. The growing middle classes had more disposable income than ever before and so could afford to spend money on entertainment. Private and public musical concerts were held and it became necessary for aspirant young women ladies to learn at least one musical instrument, usually the piano. 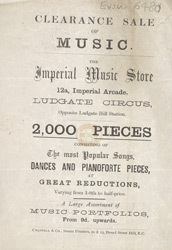 Musical-instrument and sheet-music sellers like the one featured on this leaflet were very common in 19th century Britain.